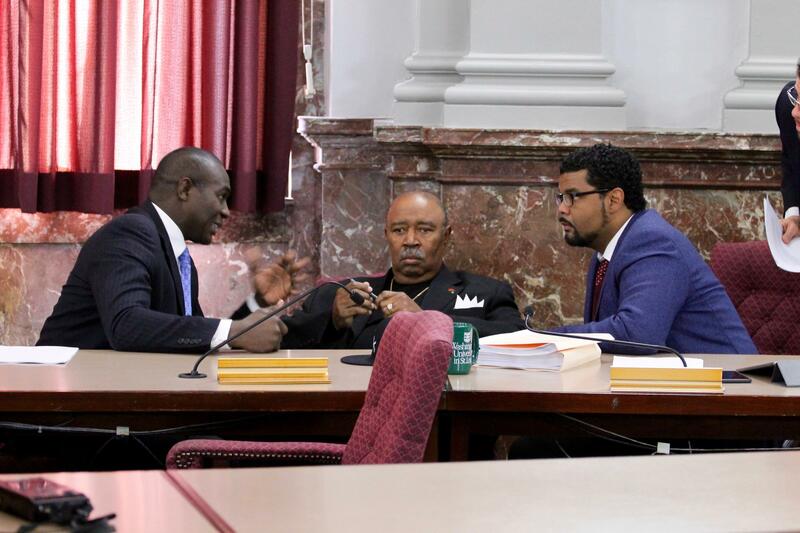 St. Louis Board of Aldermen President Lewis Reed, left, talks with Aldermen Sam Moore, center, and Antonio French about a stadium funding deal. All three voted in favor of the proposal aimed at keeping the St. Louis Rams in town. Still, Hubbard’s bill faced a tough reception. 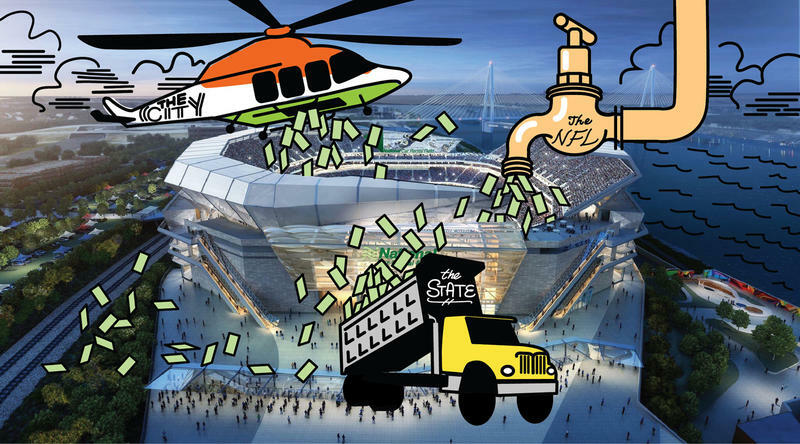 At least five of the Ways and Means Committee's eight members had expressed trepidation about publicly funding stadiums — especially without a public vote. And Alderman Antonio French, D-21st Ward, threatened to gum up the works on the legislation unless he got Slay’s office to develop a “comprehensive plan” to combat crime. Alderman Tammika Hubbard presents her legislation on Thursday to help fund a $1 billion stadium proposal. 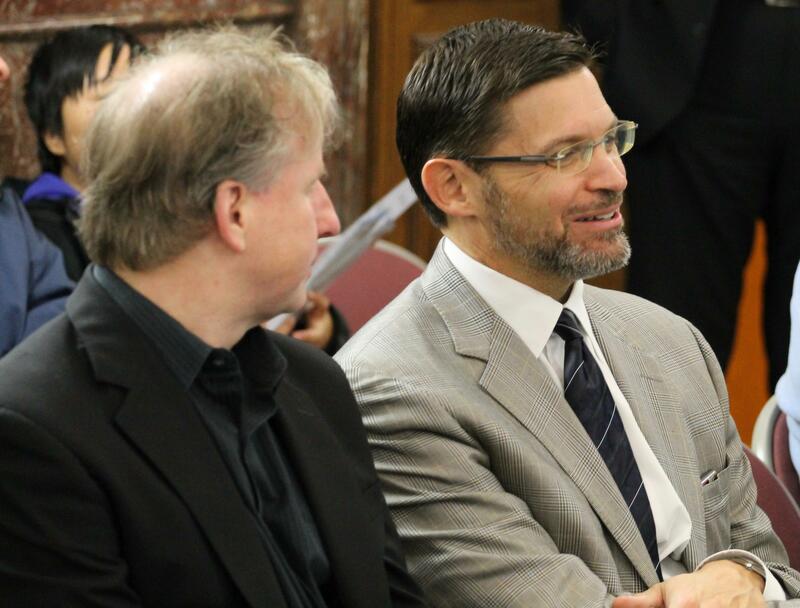 Among the aldermen who voted for the bill in committee were French, Steve Conway, D-8th Ward, Sam Moore, D-4th Ward, Joe Vaccaro, D-23rd Ward, Beth Murphy, D-13th Ward and St. Louis Board of Aldermen President Lewis Reed. Reed’s vote is especially important, because he will need to vote in favor of the final plan when it goes before the three-person Board of Estimate and Apportionment. The other members of that panel are divided: Slay is in favor of the proposal, while St. Louis Comptroller Darlene Green is currently opposed it. Dave Peacock, one of the key engineers of the $1 billion stadium, said he was heartened by the Ways and Means Committee’s decision. He said it was “cool” to see the legislative process play out. The final product didn’t exactly inspire at least two members of the committee —Aldermen Scott Ogilvie, D-24th Ward, and Chris Carter, D-27th Ward. 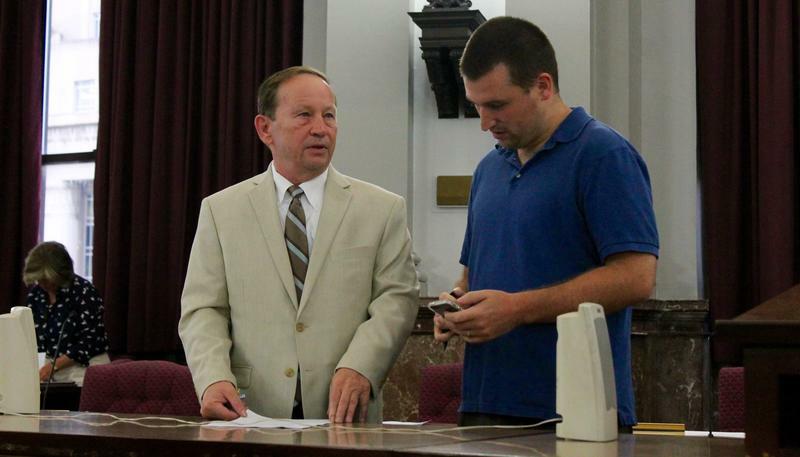 Alderman Scott Ogilvie, D-24th, leveled harsh criticism on the stadium proposal during Thursday's meeting. Ogilvie in particular said he was “appalled” that backers of the stadium plan short-circuited efforts to put any funding package to a public vote. 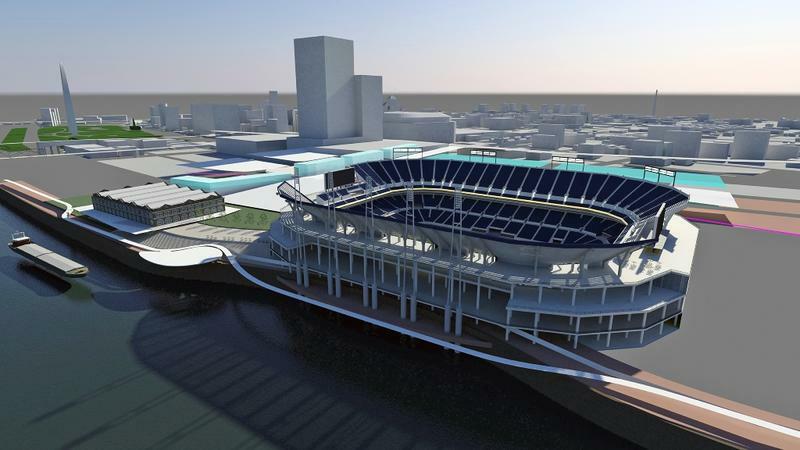 A judge struck down an ordinance requiring a public vote to fund stadiums. And Alderman Megan Green’s bill to require a referendum on the financing plan died in committee. Carter said that, while he was glad a minority inclusion plan was incorporated into the bill, he was still surprised that some stadium skeptics came out in favor of the measure. 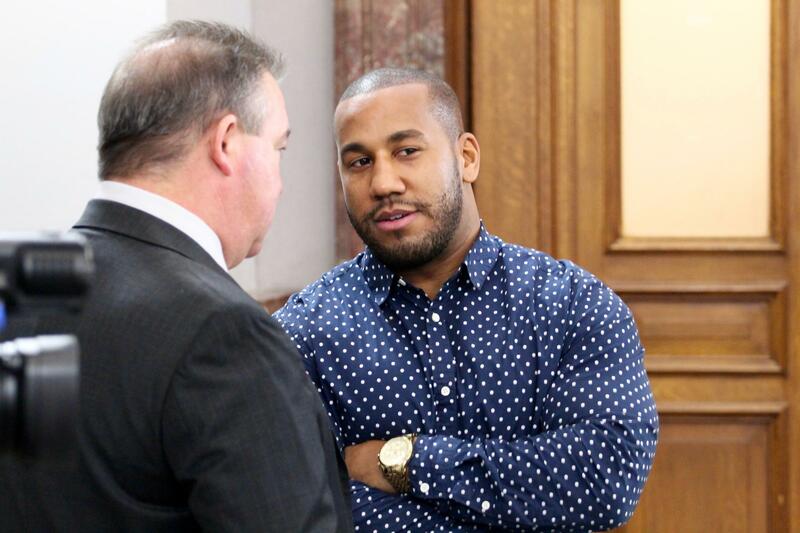 Alderman Chris Carter, right, talks with Jeff Aboussie during a break in Thursday's meeting. Carter joined Ogilvie in opposing the financing plan. 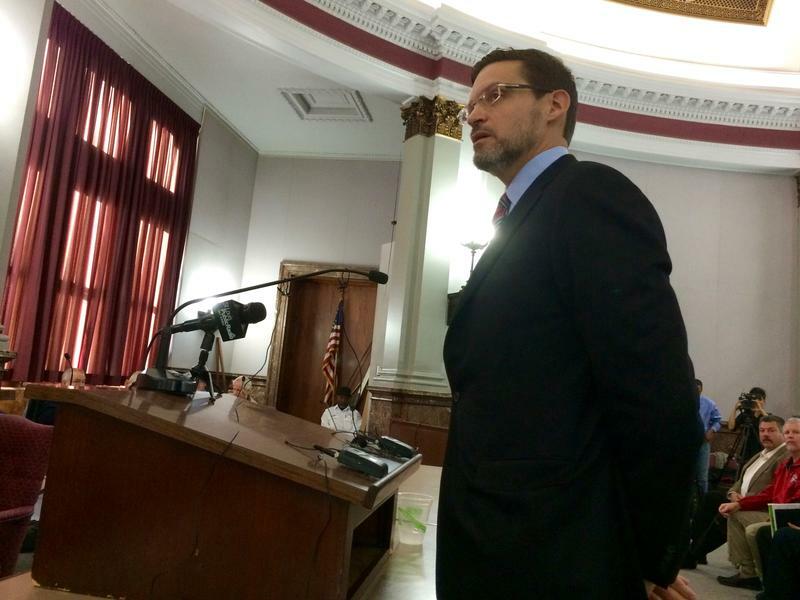 And Green Tweeted out “the deal cutting, bribery, and [corruption] at City Hall will never cease to amaze me,” comments that elicited sharp rejoinders from Aldermen Lyda Krewson, D-28th Ward, and Alderman Stephen Conway, D-8th Ward. In any case, Hubbard’s bill will now go to the full Board of Aldermen. On Friday, the aldermen took care of some procedural issues, to it not be considered until a “resumed session” Dec. 15 and 18. And even after it passes the Board of Aldermen and the Board of Estimate and Apportionment, the measure could still face some city obstacles from Comptroller Green. 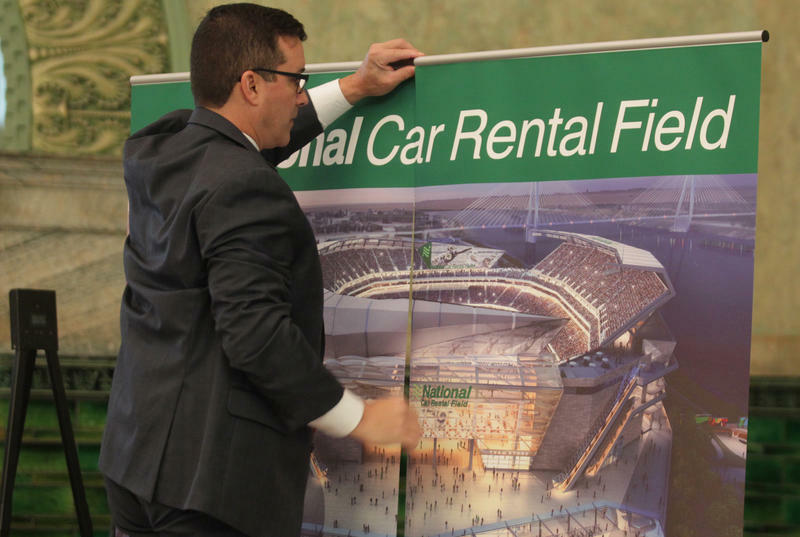 Like other opponents of the plan, Green has expressed deep concern that the revenues from the stadium won't be enough to pay off the facility's costs. She told the St. Louis American that she still isn’t sold on the plan, which is notable since her signature is required in some of the documents within the financing proposal. 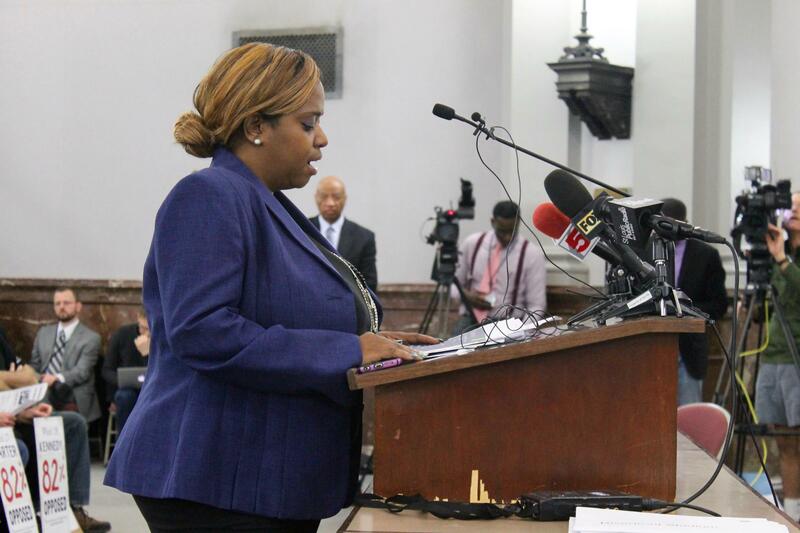 St. Louis Treasurer Tishaura Jones and state Rep. Michael Butler, D-St. Louis, held a press conference before the committee hearing expressing their opposition to the stadium proposal. 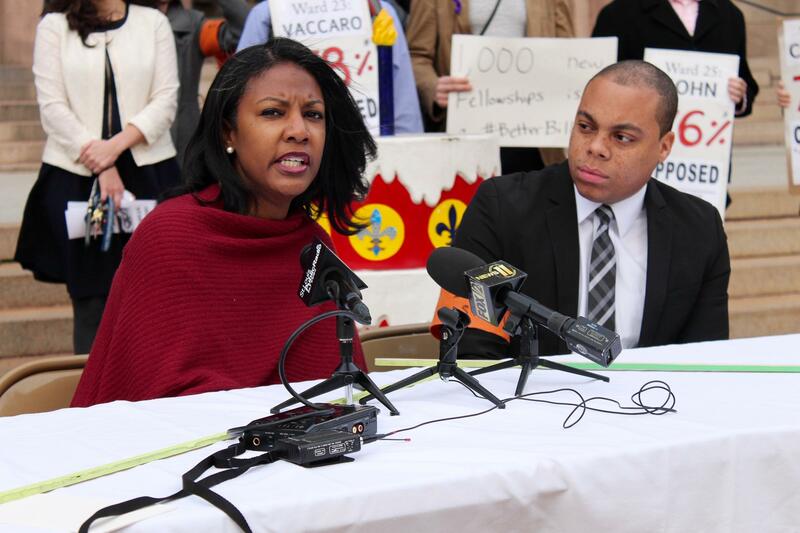 St. Louis Treasurer Tishaura Jones said Green’s role in the process isn’t insignificant. Her father, Virvus Jones, served as comptroller, and sparked legal tussles when he refused to sign onto certain agreements. Dave Peacock, right, was on hand to watch the Ways and Means Committee hearing on Thursday. “I do have confidence after interacting with some owners that they see that there is a legitimate effort here,” Peacock said. “And I have heard from some that feel it’s a good plan. Look, it’s like anything else. Just like the aldermen had to go through. They’ve got to use their judgment in assessing all the alternatives, everything that’s in front of them and make a decision. There are other potential complications for the stadium plan even if owners stymie Kroenke’s relocation plans. The NFL’s Eric Grubman told 101 ESPN’s Bernie Miklasz on Wednesday that Kroenke is under no obligation to sign onto the stadium proposal – which he claimed was lacking in a number of areas. And that possibility creates all sorts of risk when it comes to the state funding for the project. Since the financing project requires a commitment from a team before it gets executed, it’s possible that the legislature could block Gov. Jay Nixon’s administration from issuing bonds for the stadium by fiat when it comes back in session this year. So far, at least 21 senators and 120 representatives have signed onto letters opposing an state funding for the project without a statewide or legislative vote. Dave Peacock speaks with reporters after the Board of Aldermen passed a stadium financing package. That type of state legislative caught the attention of Ogilvie, especially since the financing plan possesses a clause where the state would shell out money in the event that event day tax revenues aren't high enough to pay off debt. 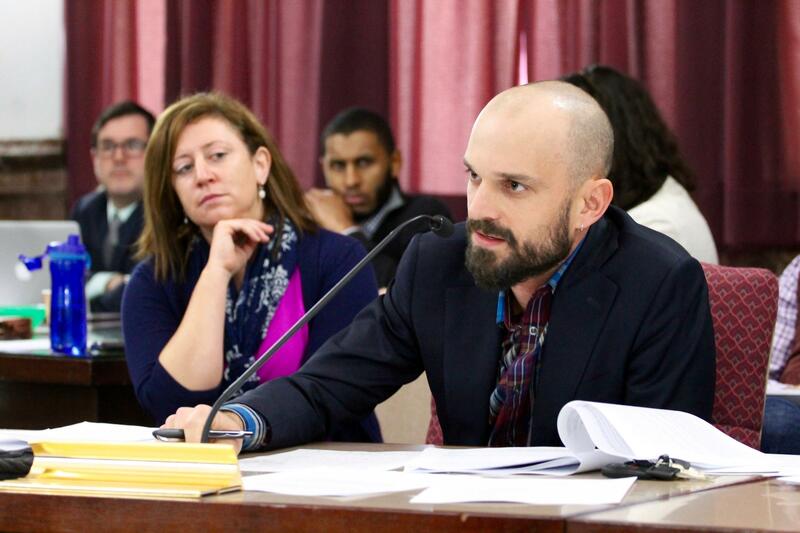 "I think the idea that we are instructing the General Assembly to make appropriations on an unknown amount in the future for an agreement that they have not agreed to is pure fantasy," said Ogilvie. "And we should recognize that this is nothing more than fantasy. And that they’re not going to do it. We’re not looking at reality." Updated with committee vote - The aldermanic Ways and Means Committee has sent the NFL stadium plan to the full board for consideration. The 7-2 approval means the aldermen could take an initial vote on the measure tomorrow. From the moment a proposal for a riverfront stadium was unveiled nearly a year ago, the roughly $1 billion facility provoked probing questions about the future of professional football in St. Louis. Some of the queries revolved around the intangible benefits of remaining a NFL city. Others asked whether voters or legislative bodies should approve public commitments to the facility. As those debates continue to play out, the St. Louis Board of Aldermen is wrestling with something more tangible: How much is it going to cost the city to build the facility and how much will a stadium bring into city coffers? The fight to force a vote on funding for a proposed new football stadium in the city will now be fought solely in the courts. The Convention and Tourism committee on Wednesday rejected a bill that would have put the proposed financing plan on the March ballot. The vote was 5-3 in opposition.